It’s 1 AM Eastern time Sunday night/Monday morning as I write this from the Hilton-Dulles hotel. I should be in bed, as I have to get up in 4 and a half hours to go to the airport and wait on standby for a flight back to Harrisburg. Instead, I need to process a little bit of my day. I think there is an incredibly common narrative of “horrible travel.” Anyone who experiences delays and cancellations and whatnot can easily relate the story with drama and flair, as if it was the “worst thing” that could ever happen to you. I want to make it clear that my intention in writing about my travel adventures today is not to evoke pity or rouse tempers. I just think it’s all kind of interesting. This post is just about my weird travel experiences, and hopefully you’ll find my stories and analysis as interesting as I do. First, I have to say that I think it’s really unfortunate that I’m stuck in DC, while many of my colleagues who call DC home are stuck in Dallas. It’s just bizarre that I had a flight through DC that wasn’t canceled—and not only did it get here, but it had empty seats on it—but my friends and colleagues who would have been satisfied to get no further than DC didn’t make it here. There’s nothing to be said about why it happened, but it seems worth noting. I certainly can’t complain that I only got to DC when some folks might not get out of Dallas until Tuesday. A colleague of mine had the same DC connection to his home destination. We both had seen that it was still on-schedule despite knowing many of our fellow Creating Change participants had had their DC flights canceled. We decided to go to the airport early in hopes of seeing if there were alternate connections that could still get us to our home destinations. When we got there, we were both told that even our connecting flights were still good to go, and more importantly, we weren’t really given the choice to rebook. If it’s going, it’s going, and that’s just how the airline works. I could be really pissed about this. After all, our intuitions turned out to be correct, as we would learn upon landing at Dulles that both our connecting flights were canceled. When the airline knows that a ton of DC flights have been canceled, why wouldn’t they air on the side of caution? Maybe they want to keep our business, but also, why wouldn’t they? It’s easy to complain that in the “Age of Information” we should be able to know for sure the status of flights. Surely, though, if we didn’t trust air-traffic controllers to make that call, air travel would be more frustrating and complicated than it currently is. The pilot informed us that we would be one of the first flights to land at Dulles and that they only had one runway open. At first, I kind of felt special. We were the lucky flight that got to land. But runways are necessary for both landings and take-offs, so it didn’t bode well for the amount of flights that were probably still going in and out of Dulles. Truly, the quality of the tarmac at Dulles was of concern. Our runway landing was fine, but our taxiing was quite rough. The tarmac was clearly coated with padded snow and ice and it was the most unusual taxi I ever experienced. It didn’t take long to get a standby flight for tomorrow morning, but I had to wait in a very long and slow line to make sure my bag was retrieved and to get a voucher for a hotel discount. The folks in the line were not happy. Many were by themselves and so didn’t have a companion with whom to socialize (myself included, as my colleague’s situation was not as optimistic and he is now pursuing other means of transportation). Tempers were high. The situation is what the situation is. Some folks were upset and looking for answers and explanations. Others had accepted the fact they weren’t leaving DC tonight but were frustrated they had to wait so long to get answers about what they’d be doing next. Having gotten some good (and much needed) sleep on the flight from Dallas, I was moderately chipper and was hoping I could make my own relaxed state contagious. I quietly hummed “Don’t Stop Believin'” and “Always Look On the Bright Side of Life,” secretly hoping they’d catch on and the whole customer service queue would break out in song. It didn’t happen, but I think people were somewhat calmed by my smile and relaxed swaying. One man was not happy. He was from Montreal and was furious that something like weather would be an excuse for the airline not to pay for his lodgings, let alone keep his flight from taking off. After making it clear that this would never happen at the Montreal airport, he totally berated the poor agent and his overseeing manager as well. The manager calmly answered that the problem was the weather. He acknowledged that the man was right and admitted that Dulles is not prepared (or more importantly, equipped) to respond to three feet of snow efficiently. That didn’t change the fact that the underlying problem was the weather. The man was sort of committed to being pissed, but the manager’s calm (and slightly snarky) response was impressive and did help pacify the man at least slightly. 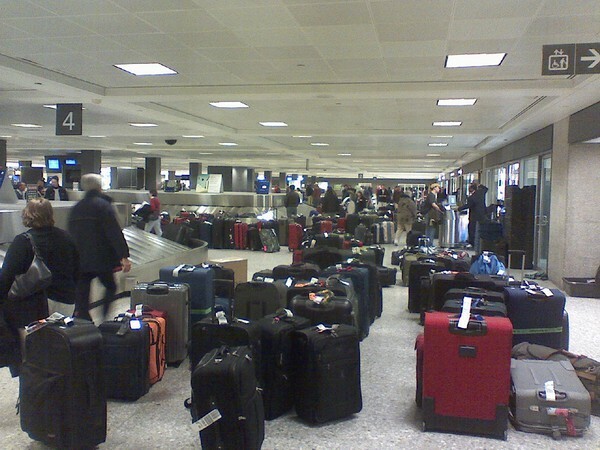 To give you an idea of how complicated the weather makes things for the airport I took a picture of the scene from the baggage claim, I took a picture with my phone. There were literally bags everywhere. I can only imagine what causes this. Some people probably abandon their bags by choosing alternate forms of transportation. Some people might end up flying without their bags. Some bags might have ended up flying without their owners. As an outside observer, it’s difficult to grasp exactly what happened. Still, it was a sight to see. The picture I took does not do it justice. And keep in mind, I took this picture at 10:30 PM. Downstairs there was a line at least 100 people long to get taxis to DC locations, especially since some of those folks might not be going anywhere until Tuesday, at the earliest. This isn’t an ideal situation for anyone, but there were some airport staff working incredibly hard (and enduring a lot of duress) to try to accommodate folks, and I commend them for that. The hotel clearly does the same. My room here at the Hilton is nicer than the one I had in Dallas the past four nights and I’m paying half the price for it. They also had the free airport shuttle running regularly, and served hot dinner until midnight. I’m sure their staff is tight given lots of people are still stuck and it’s hard to get around, but they have done much to ease the frayed nerves of stressed travelers. On the shuttle to the hotel, I again tried to maintain some positive attitude. I offered to my eight co-passengers, “This is fun, isn’t it?” I felt particularly bad for a mother who was traveling with her son. Probably about eight years old, her son was desperately tired, and when we were in line to check-in he even started to cry—not a whiny cry but a sincere cry of exhaustion and confusion. I can only imagine the stress of dealing with delays and hotels compounded by a young child who just isn’t equipped to deal with those circumstances. I made a lovely connection as a result of my cheerful conversation on the shuttle. I met a marketing executive of sorts from northern California who was on her way home after sailing around the Virgin Islands for the past week or two. Our rooms were across from each other, so we agreed to meet for a drink. Despite being two very different people, we had some lovely conversation. You’d think I’d be tired of networking from five days of Creating Change, but it wasn’t networking. It was just two people making the most of the circumstances. It’s now almost 2 AM, and I’ll get barely four hours of sleep before I return to the airport and try to make my way back to Harrisburg. I’ll sign off here, but I just want to offer a final thought to make some meaning of the stories I just told. In life, we only get the days we get. The days that aren’t spent doing the things we think we should be doing are no less a part of our lives than the other days. I’m not thrilled I’m stuck in a hotel in a city overwhelmed with snowfall, but who cares? I can still make something positive out of it. Pouting or venting would do nothing to make me feel better and would only reinforce the frustration of those around me. If we all just took the time to look out for each other and realize we’re all going through these experiences together, I think we’d all be better able to respond to complications with the optimism of opportunity. This wasn’t what I was expecting, but you know what? It’s a new adventure. There are 1 Comments to "Post-#CC10 Travel Adventures"